You have a DSLR? Start pointing it up! You don’t need to be an expert to get some compelling pictures of the night sky. Here are six reasons to give astrophotoraphy a shot. It really doesn’t matter what lenses you have, you can apply them to astrophotography. Short focal length lenses are actually the easiest to start out with. The short focal length allows you to do exposures of several seconds from a fixed tripod without noticeable star trails, so there’s no need for a tracking mount. This is ideal for capturing whole constellations, or for basic landscape astrophotography to add a down-to-earth context. While you really don’t need a telescope to get started into astrophotography, you can do amazing stuff when you have one. When connected to a camera, a telescope is nothing more than a giant telephoto lens. I have two lenses for my Canon T3i camera, an 18-55mm and a 55-250mm. I also have a Celestron C6 SCT telescope, which for all intents and purposes is a 1500mm lens! Something to keep in mind is, just like regular photography, you don’t always want a huge telephoto lens in astrophotography. In fact, there are many cases where you really want a short focal length camera lens. My telescope doesn’t help if I want to photograph a constellation or an Aurora – the field of view through the scope is far too small. Instead, a short focal length lens is exactly what’s needed. You don’t even need a tracking mount, in fact, having one doesn’t really make a difference here unless you are shooting through a long focal length telescope. The moon is so bright that you want a really short exposure. This picture below for instance is a 1/200th exposure at ISO 1600. You can easily lower the ISO to 100 and take a slightly longer exposure for a similar (perhaps even better) result. 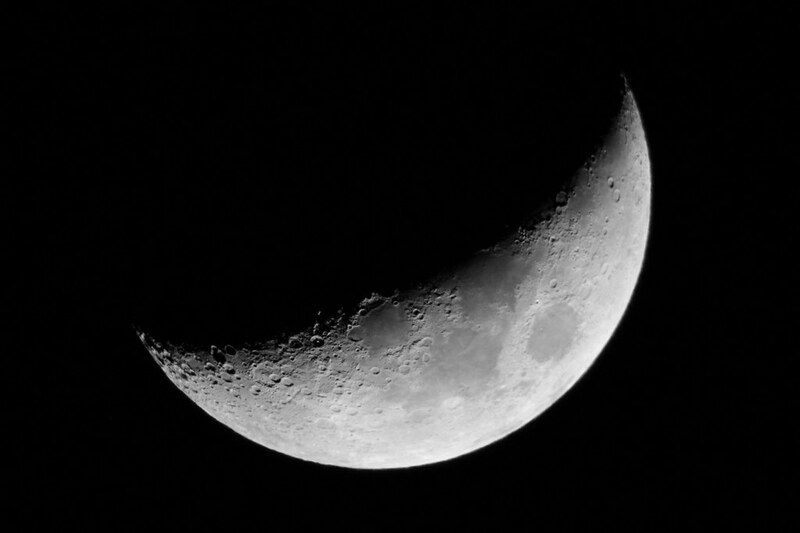 The image above was shot through my C6 telescope, but you will get surprisingly good results from just about any lens. 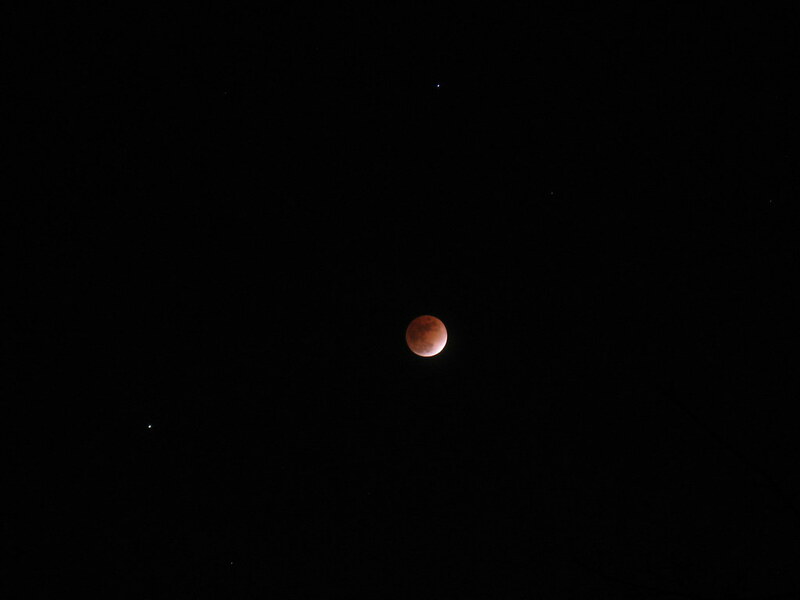 In fact, you can even capture nice moon photos with a compact camera. 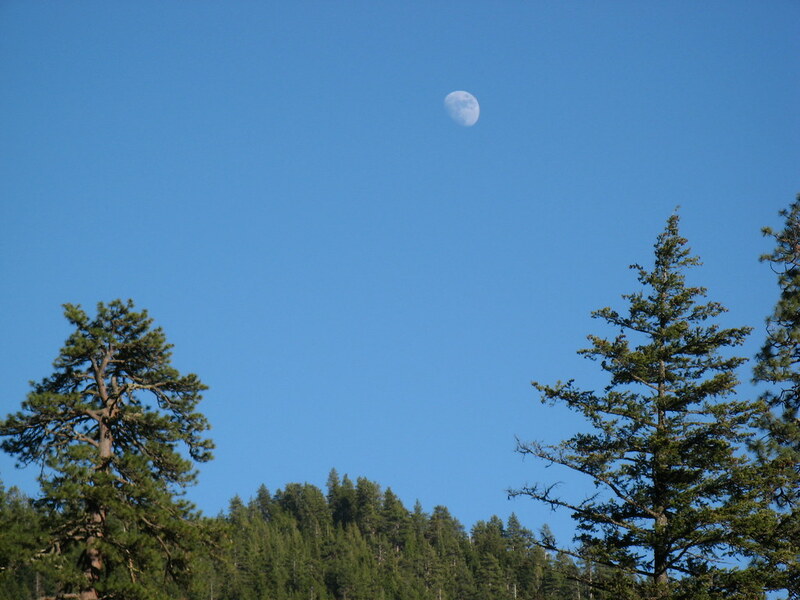 The moon is also the one stellar object you can photograph during the day, and relatively easily compose into landscape shots. Here’s an example I shot years ago with a simple point and shoot camera while on a hike, and another shot with that same camera during a lunar eclipse. Constellations are also easy targets for wide angle lenses. The difference now is we want to take longer exposures to collect as much starlight as we can without getting star trails. Remember that the sky is moving. Actually, you’re moving with the earth’s rotation. If you take a 30 second exposure just pointing up at the night sky, you’ll see the stars become streaks. You’ve probably seen photos like this, which is yet another style of astrophotography. For the purpose of capturing a constellation, we want to avoid this effect. The easy way to do that is to keep the length of your exposure in seconds multiplied by the focal length of your lens below 400. For example, with a 50mm lens, you could leave the shutter open for up to about 8 seconds before the stars start looking more like streaks than dots. 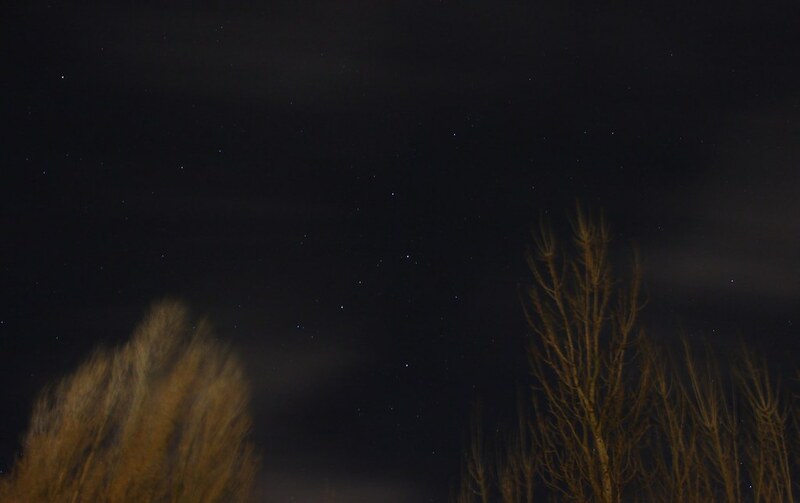 Edit: I found a few holes in the clouds tonight, so here is a sample shot of the constellation Cassiopeia. Cassiopeia looks like a ‘w’ rotated 90 degrees clockwise centered between the trees. The photo is a 10 second exposure with a 24mm focal length. Using the rule of 400, this one is only up to 240. If the wind and clouds hadn’t been moving so fast, I might have tried some longer exposures. The tree branches are blurry due to the wind. Jupiter has been very prominent in the sky for some time now. 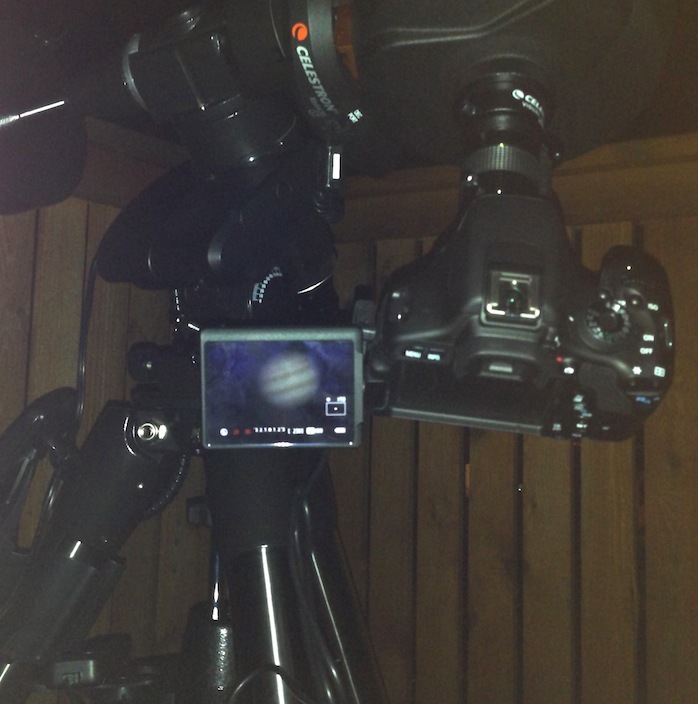 Whenever the clouds clear off enough to setup the telescope, Jupiter is almost always my first target. For those of you that do have a telescope and are ready to connect up your camera, you’ll just need a T-Adapter and a T-Ring specific to your camera. There are several different types of T-Adapters available, including one that slides into a standard 1 1/4″ visual back, like this Celestron T-Adapter. This is handy because you can also use a barlow or a filter. There are also T-Adapters specifically for screwing into the back of an SCT, or for 2″ focusers. Between the T-Adapter and T-Ring, you’re only looking at about a $50 investment to turn your telescope into your largest telephoto lens. The above photo is an example of what I can achieve with my telescope and a 2.5x barlow in average seeing conditions inside the city. I want to emphasis this is a single short exposure photo – I’m not doing any special processing. Planetary photography is a case where a tracking mount is very helpful, but really any tracking mount will suffice. We are just taking short exposures, so tracking accuracy isn’t critical, and you can easily manage by just moving your scope manually. If you’ve heard much about astrophotography, you’ve probably heard terms like subframes, image stacking, dark frames, flat frames, light frames, etc. Frankly, you don’t need to worry about any of it to get pretty compelling results. The only processing I did to any of the images in this article would be a few brightness/contrast and color adjustments. Nothing you wouldn’t do to any other photograph in iPhoto, Picasa, or any other basic editor. And that was optional; I felt they were all pretty impressive straight off the camera. In short, don’t be intimidated thinking you need to do a lot of post-processing. We have two major comets on the way this year. Comet Pan-STARRS coming by in March, and comet ISON in November. Comet Pan-STARRS should be easily visible to the naked eye, and present a great photo op for amateurs and professionals alike. Hopefully this will be just a teaser before Comet ISON, which is predicted to potentially be visible in daylight! Two comets in one year is a rare opportunity. Now is the time to start learning how to use your camera to best capture these rare events! 13 Responses to "6 Reasons to Try Astrophotography with your DSLR"
I’ve heard using a Barlow lense may help with the focus issue. I have a setup question about using a reflector with a DSLR. I have an older Celestron 4.5 reflector that I purchased about 20+ years ago… kept to the smaller size for easier transport since I need to get further away from the city lights I live near. I recently purchased a Nikon D800 and a T-ring and Universal T-adapter. The camera mounts fine to the focuser, but it is impossible to focus the image, the camera sensor plane is too far away since the focuser is too tall. Found a site online where the author cut down a focuser to get this to work, or suggested shortening the reflector’s tube so the mirror distance is less, I guess changing the focus distance (not sure that would work or be possible without special machine tools. Is this the only way for this to work, or are there other ways to do this without a lot of machine work. Many newtonian reflectors are designed with a much shorter focal plane that works fine with an eye piece, but doesn’t accommodate a camera. So, your choices probably are to either modify the focuser or scope, or find a different instrument. A good budget option that will work with a camera is the Orion Short Tube 80 refractor. There are newtonian reflectors that are designed to work with cameras, starting from about the 4.5″ size. Pricing starts at about $120 and $150 for the bare scopes, no mounts or eye pieces. Just wanted someone to confirm that I was not misunderstanding the issue. Do you know of any posted input on the math behind shortening the tube… that would seem to be a more feasible alteration than the rather more complex task required and described in the post about changing the focuser. (http://dave-anderson-photo.com/blog/2011/03/29/setting-up-an-8-reflector-telescope-for-astrophotography/)? Does not the curvature of the mirror surface need to change if the tube is shortened? Just get a barlow – it fixed my problem. Appreciate the info, and can not wait for comet ISON to show up !! What is the device you have that is showing the view from the DSLR outside of the camera? (The external screen) I’ve had a heck of a time focusing without this device, I need one. I have a Canon T1i and a CPC 800, but seeing through the viewfinder is a bugger, and live view seems to eat my battery really quickly. That’s actually the camera display. The Canon T3i and newer models have a fold-out screen. I find that the live view works quite well for focusing, and you can reduce the battery drain by dimming the LCD brightness (live view also locks up the mirror on the camera to prevent mirror flop). A battery tends to last me about 2 hours of continuous use, so I just keep a second one charged to swap in. Hope that helps.